Stebel Nautilus Compact kompressor horn, op til 139 DB !!! Lagerstatus: På lager, levering 2-3 dage. Der medfølger relæ til monteringen. Vigtigt, Benyt altid det medfølgende relæ, da du ellers ikke får den fulde lyd fra hornet. Three years after launching the "Never-Before-Seen" twin-tone airhorn "Nautilus" a "Compact" version is now available from stebel! Reduced in size by about 30%, thanks to its thin shape and design of its sound exit, it is even easier to install! Your car horn has an extremely important function, try it and let yourself be hard! tHe NAUTILUS horn features compact space-saving engineering that no other twin tone air horn in the world can offer. It is very fast and easy to install because it requires only ONE fixing point (and a single electrical connection). NO TUBES are necessary! The excellent sound output is INSTANT thanks to an incorporated perfectly balanced air jet system. Its incredibly reliable motor withstands more than 50.000 continuos action cycles! The air intake hole has a patented protection system which insures a pleasant High and Low Tone and surprising power! The Nautilus has a beatiful "MADE IN ITALY" design which makes it perfect for openly visible installations! 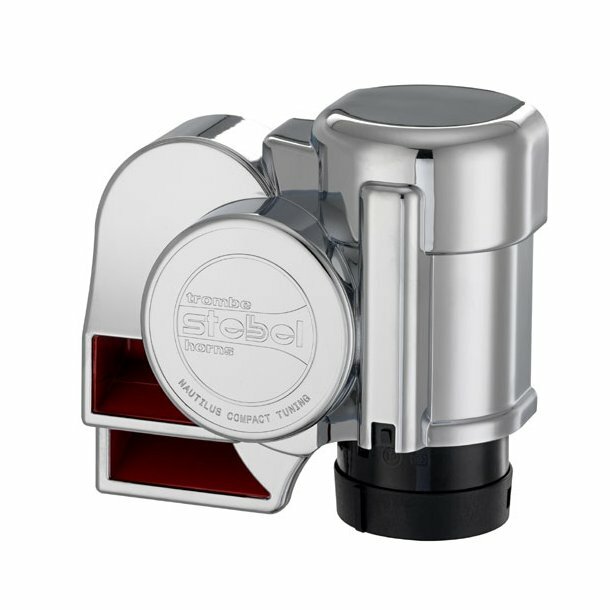 All this has been PATENTED INTERNATIONALLY in order to give you an EXCLUSIVE STEBEL HORN!